Wanted to put the word out on some big shows happening over the next couple of weeks beginning today. This afternoon, Thursday, July 27, the original Colorway lineup featuring Dave Hayes on bass and vocals and J.J. O’Connell on drums and vocals (featured on both studio albums) will be playing a show in downtown Amherst at the Masonic Lodge. The lodge is located on Main St in Amherst between the Black Sheep Cafe and the police station (on that side of the street). It’s free, all ages, and should be a lot of fun. All the details are below. Opening the show will be Court Etiquette, one of the best new bands to come out of the Pioneer Valley in a long time. Check their single “Above Me” out right here and like them on Facebook here. It all begins at 5:30 with an hour long set from Court Etiquette. Then, Colorway v1.0 will hit around 6:45 and play until 8pm. Next Saturday, August 5 don’t miss Jeff Fest. This multi-band/performer bill is in its second year and celebrates the life of Jeff Martell who was a prominent figure in the valley’s music scene until his tragic passing last year. All proceeds benefit the Jeff Martell Scholarship Fund at Greenfield Community College. And finally, on Sunday, August 6 some of the finest musicians in the area will be assembled at the Iron Horse Music Hall to celebrate the life of J. Scott “Bow Bow” Brandon, bassist/trumpeter for Drunk Stuntmen, Broker, and many other valley groups. He passed far too young at the age of 44 this past June. This will be a Drunk Stuntmen reunion of sorts. The band sees the first collaboration of Steve, Terry, Scott, Alex, J.J. and Dave Durst in 10 years for a closing set of Drunk Stuntmen songs featuring bass playing by Dave Hayes, Ray Mason, Steve Sanderson, Miranda Brown and Bow’s brother, Adam Brandon. Other acts on the bill include Scott Levesque, Mark Mulcahy, Rob Skelton, Dave Hayes, Zip Cody, Lesa Bezo, Henning Olenbusch and Kay McKinstry. That’s it for now, gang. I wish there were two less memorial shows, if you know what I mean. But I’m proud to be included in both of them and I hope to see you there. Remember folks, music connects us all. It can heal and revive. It helps join people from all walks of life from one end of the globe to the other. It’s what we do. It’s what I’ve done for as long as I can remember. And it’s what the world needs right now more than ever before. Please forward this email along to anyone who you think could benefit from the power of the music we make. PS: This is always a sad time for me to say goodbye to my favorite month: July. You can listen to the song I wrote about it here and watch the video produced by Tom Adams and Reelife Productions right here. Grab some dinner hang out and listen to two great bands in downtown Amherst. Presented by the Amherst Business Improvement District this series has grown and taken on a life of its own. Court Etiquette is one of the areas newest bands, Their sound is reminiscent of old school NYC bands (Lou Reed/Television) and have been cutting their teeth opening up for a few great bands at the Iron Horse. Check their single “Above Me” out right here and like them on Facebook here. Summer is the best. Let’s all hang and enjoy it together! See the whole summer lineup for the series here! Check out the Amherst BID page here for more. Special note: This show will feature the original lineup of Colorway featuring Dave Hayes on bass and J.J. O’Connell on drums. Not to be missed! 5:00pm – 10:00PM Gates Open at 4:00 PM. 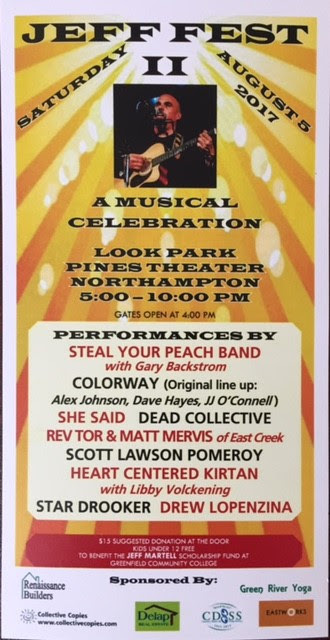 Friends and Family celebrate the life of bassist and trumpet player of the undeniable local hero band through songs poems and stories. All Proceeds from this show to go to a fund yet to be created by the Northampton Arts Council to fund working touring musicians. Performers scheduled to appear: Scott Levesque, Mark Mulcahy, Rob Skelton, Dave Hayes, Zip Cody, Lesa Bezo, Henning Olenbusch, F. Alex Johnson, Terry Flood, Soft Rock Scott Hall, Dave Durst, Kay McKinstry, Stuntman Steve Sanderson. Purchase advance tickets here. This show is likely to sell out.